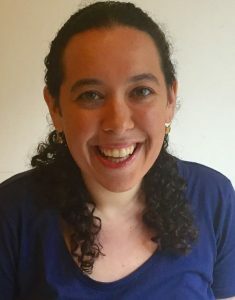 About the Author: Chani Markel is a person who stutters, school-based speech-language pathologist, and certified children’s yoga instructor, currently living in Manhattan. She is very involved with the NYC self-help community and regularly attends and presents at National Stuttering Association annual conferences. She enjoys combining her passions for yoga, mindfulness and creative writing into speech-language pathology. Growing up as a young child who stutters, I never believed that one day I would have the courage to speak openly about my stuttering. Thankfully, as I have progressed through my stuttering journey, my perspectives about stuttering have drastically changed. After receiving successful speech therapy as a teenager and becoming involved in the stuttering community as a young adult, I am much more comfortable speaking my mind and letting my stutter be heard. Show up. I know that when I speak, I take the risk of stuttering, and that is OK. I am willing to take that risk to share my truth. I give myself permission to stutter. I will say the words that I want to say. I will not substitute tricky or feared words for words that are easier to say. I will not delay my words for a time when I feel more fluent. As someone who was covert for most of my middle and high school years, I know this is way easier said than done. For me, every word that I give myself permission to say, rather than avoid or escape from my stuttering, is a mini success to be celebrated. I also give myself permission to choose to use a speaking strategy or speak in a way that is easier or less struggled. I give myself permission to choose the way that I want to speak because it is my right to do so. My voice and my opinions matter, even if I stutter. Stuttered or not, what I have to say has inherent value. I can speak my mind about topics that I am passionate about and convey my thoughts effectively to my listeners, regardless of my fluency. As an SLP, I will speak my mind to advocate for my students, their families and the people in my fellow stuttering community. I will speak my mind on behalf of those who may be afraid or unsure of how to do so. I will speak up for my clients who may be suffering, disadvantaged or not have the same opportunities to express themselves. Educating the public about stuttering, debunking common myths about speech and language disorders and advocating for those who may not know how to advocate for themselves was part of my drive for becoming an SLP. It is just as important, if not more so, than providing evaluations and treatment. My mission is to help children learn to speak their mind. My ultimate goal as an SLP,both for kids who stutter, as well as for all of my students, is to help them learn to find their voices. I will always make my speech therapy room a place where students feel comfortable sharing their thoughts without the fear of being judged. Whether it is a five-year-old who is upset about having to negotiate with a classmate about where to sit during read-aloud, or a group of seventh graders who are anxious about taking state exams, I often begin my speech therapy sessions by having my students each take a turn to talk about what is on their mind. Sometimes we stop and discuss the issues they address, other times I simply acknowledge their feelings and move on to my daily objectives, but I ensure that all of my students feel heard. Following these principles can be challenging. I am honest with myself that some days, stuttering may feel like a burden that I would rather not carry. However, by striving to live by this “stuttering manifesto,” I pledge that each day I will not let my stutter hold me back from speaking my mind. Speak your mind, bare your soul, share your spirit. Hello, How the pratice yoga can reduce stuttering? Can you show us in video this pratice yoga? I don’t currently have an videos to share demonstrating using yoga in stuttering therapy. However, yoga is a great way to manage tension and anxiety, which can be beneficial when managing stuttering. I also love using mindfulness activities in my speech therapy sessions to help clients “stay in the moment” when stuttering (both physically and psychologically)! Thank you, me too! However, I find that #2 or #3 is probably the most challenging of the 5. Thank you, Chani, for sharing these principles. It is extremely helpful to me to be taught this, and reminded how important it is to have these principles as guiding values. Thanks so much, I really appreciate the kind words! Thanks for all you do for the stuttering community word-wide! Hello Chani. I really enjoyed reading about your experiences with stuttering as well as you working with students who stutter as a SLP. I am currently a graduate student and I am in a fluency class at the moment. I really liked how you talked about advocating for your students who stutter and how you educate the public about stuttering. What are some of the ways that you have been able to educate the public about stuttering? Thanks for writing. Some ways I’ve educated the public about stuttering has been speaking on graduate panels in universities, setting up tables with pamphlets and other educational materials in the park on ISAD with my local NSA chapter and self advertising my stuttering in public places like in stores, parks or coffee shops. Hope that helps! Hello! As a SLP grad student, I truly appreciate you sharing these principles! Your bio states that in addition to being a speech-language pathologist, you are also a certified children’s yoga instructor. This has always bee on of my dreams and goals in life! I am fascinated by the benefits that yoga and mindfulness can have on speech therapy in so many areas. One day, I also hope to combine yoga and mindfulness into my therapy sessions! Do you feel that yoga and mindfulness played a large role in the development of your stuttering manifestos? Hi Lindsay, if your dream is to become a yoga instructor, go for it! I think that being mindful during moments of stuttering was a HUGE positive step for me- both in dealing with my stuttering more “productively” and being more accepting. This factor definitely impacted my development of my stuttering manifesto! Thanks for commenting! Hi Rob, I really appreciate you writing. I’ve heard you speak on StutterTalk and other stuttering podcasts and I love hearing your insights. I think we have a lot of similar experiences being a PWS and an SLP. The way I look at your comment giving myself “permission to stutter” and “permission to talk” as slightly different. I think that for me, giving myself “permission to talk” is a first step. It is my #1 detailed in the article, it is showing up and allowing yourself to speak. For me, giving myself “permission to stutter” is the second step in the process and a more difficult task. It entails allowing myself to stutter openly without shame or trying to hide. At this point, I find it pretty easily to give myself permission to speak, but it can still be challenging for me to give myself “permission to stutter” because it feels like I am exposing my struggles out in the open. I hope that helps! I love your manifesto! I wish we could shout #2 and #3 from the mountain tops! But my heart goes out to YPWS, having been involved in children and youth camps for almost 30 years, so #5 should be on every teacher’s agenda and I’m so happy you make this your priority as well. I also wish friends would be welcome into the therapy room, to understand, support and even help to do assignments together. Keeping them talking is definitely key! We really enjoyed reading this article and feel like it will be an empowering resource to share with friends and clients. As an SLP and an individual who stutters, do you ever feel a pull between the two communities? If so, how do you manage that? – Emily Taylor, Dylan Thorp, Sarah Twigg- MSP graduate students at the University of South Carolina. I loved this article! Your attitude and thoughts about stuttering are very brave. What is your favorite part of being a speech therapist? What have you learned, not only about stuttering, but many other speech and language disorders from your clients? Thank you again! I am an SLP graduate student and I found your post very inspirational. I’m happy to see you have become the person you wanted to be and continue sharing your ideas with the world. I liked reading the part that says that every time you speak you take the risk of stuttering, but taking the risk is worth it because what you have to say has value. I’m also happy to know that you have become an advocate for children who stutter and for their families. You are a person of great value in the SLP and stuttering community and I’m sure you are making a difference in the lives of many children who stutter. keep up the good work! Thank you for sharing your manifesto. I love your idea of letting the children speak what is on their minds before beginning therapy. This sounds like such a community-building experience. Have you noticed that the children are closer/more comfortable with one another since you implemented this? Hello! Thank you for sharing your inspiring manifesto. What is your favorite part of being a speech-language pathologist? I wish you the best! Thanks! I love being able to customize my therapy for my individual students and focusing on their specific strengths and challenges. Thank you so much for sharing your experiences and manifesto with all of us! I really love how you allow your students to come into your classroom and see it as a safe space where they can open up and not worry about others opinions. I also think it is beautiful that you said that by speaking your mind, you are sharing your unique spirit with the world. How and when did you discover your five essential principles? It’s definitely been a process, starting from when I was in high school and received speech therapy at age 18 till the present day. Thanks for writing! I am a speech language pathologist student and I wanted to say that i really like how you are so open about stuttering and speak what is on your mind and children.